Sidekicks rarely shine when thrust into the spotlight. But what about a few hundred of them? The Minions, having been the best part of the two previous "Despicable Me" movies, swarmed the screen in "Minions" this summer. As candidates for center stage, they are seemingly ill suited. They are slavishly - if rarely competently - devoted lackeys. They are underlings by both definition and their lack of height. They don't speak intelligibly. To be fair, this isn't a bar all of Hollywood's leading men reach. Instead, they talk in a bright babble that belies their fondness for colorful phonetics. "Banana" and "pi§ata" are their kind of words. Their unsuitability for the lead role, or just about anything else, is much of the fun of "Minions." The film largely succeeds in its simple mission: More Minions! Directed by Pierre Coffin (who co-directed "Despicable Me" one and two and voices the Minions) and Kyle Balda, "Minions" begins in fine form. The little yellow ones are already humming the Universal theme as the film begins. With Geoffrey Rush narrating, we get the history of the Minions. It stretches back across eons and begins with them - a curious early mammal - literally walking out of the sea. But the evolution stops there. For thousands of years, we see, they've been letting down their evil masters, from a Tyrannosaurus Rex accidentally tipped into a volcano, to Dracula, whom they excitedly wake with a birthday cake and wide-open blinds. 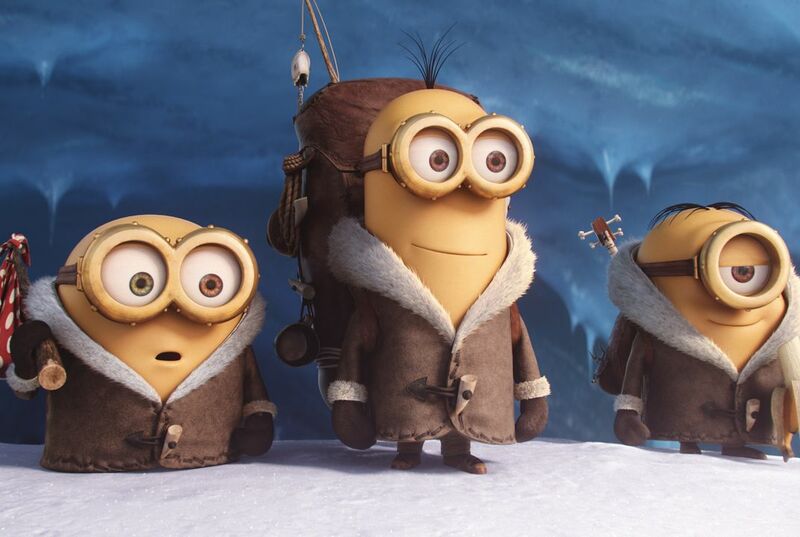 The Minions have their own Ice Age, however, ending up leaderless in Antarctica. After a few hundred years, the joy of snow ball fights beginning to dim, three of them - Kevin, Bob and Stuart - set out on a quest to find a new supervillain to idolize. Soon, they're on their way to Villain-Con, a riff on Comic-Con, only a convention celebrating the likes of Scarlet Overkill (Sandra Bullock), an evil world-conqueror in a beehive. The trio inadvertently wins a job in Overkill's entourage,and they're soon enmeshed in her plan to take the British throne, along with Overkill's inventor, Herb (Jon Hamm). There are, it should be noted, more ambitious seats of power to set one's diabolical sights on. But this is 1960s Swinging London. That makes for a colorful backdrop. The irreverent slapstick unfortunately gives way to the kind of action set pieces that have now even corrupted children's movies. The bombast, though never serious, is still loud enough to, and for too long, drown out the best thing the movie has going for it. And that's the chuckles and squeaks of the Minions. It also makes it harder to hear the other key sound accompanying the Minions: the laughter of children. What are the Minions but stand-ins for kids? Mumbling half-understood words by the mouthful, they plunge headlong into any task, usually wielding a dangerous object they shouldn't. Nothing makes them double over like a good pratfall and they will insist on a goodnight kiss or bedtime story. Teaming and relentless, they will melt the heart of any guardian, even a supervillain. Coming on the heels of Pixar's "Inside Out," an emotional wallop that mostly knocks out misty-eyed adults, "Minions" is a different beast. This one's for the kids. "Minions" is a Universal Pictures release. It is rated PG by the Motion Picture Association of America for "action and rude humor." Running time: 91 minutes. Rating: Two and a half stars out of four. That they are probably really humorous and work as a team. CTQ: The author means that the Minions will be relatable to young children, as they babble with barely, and sometimes un, dignified words. Minions are a stand-in for kids because they do things that kids do. Their laughter resembles the laugh of a child. The other proven reasons are that they wield weapons and go into battle without thought. They do things that resemble something a child would do, like a goodnight kiss or a bedtime story. The author means that only a kid would find this amuzing because of the lack of realization and intelligence. 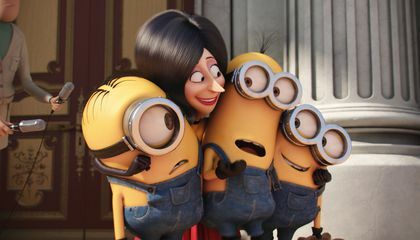 CTC: The author means that minions are like the kids in our world,but little yellow beings in the movie world. What the author means by "Minions are a stand in for kids?" is that the Minion are like children. Clueless, full of wonder, head strong and playful. They mumble unintelligible words like that of a child trying to learn to speak, running around with things such as a mace or a sword like a child would with scissors or a knife. The statement that the author says "Minions are a stand-in for kids," means that Minions are meant to be a mirror image of kids. The way they act, talk, and play around are images of how toddlers and kids act. They mean they're stand ins for kids because they act, laugh and relate to kids. The author means by saying "minions are a stand-in for kids." means that is more of a childish movie and that mainly kids will find it funny or interesting. The author means that Minions are like children; having very childish behaviors and customs. They do things that children would do.